The Label & Packaging Innovation event 1-4 April 2019 attracted more than 600 customers, brand owners, industry suppliers and journalists. Demonstrations spanning across Bobst, Mouvent and the REVO team partners showed several world-premieres and breakthrough technologies live. “The number of working equipment on-show was impressive. Visitors could participate in hands-on demonstrations of inter-linked equipment and complete workflows,” added Dan Pulling, EMEA business development manager HD Flexo & Color at Esko. Each of the event’s three main themes of time-to-market, color consistency and food packaging safety was presented to visitors. Live demos showed how to achieve labels and packaging production faster, consistently, safely, and with greatly reduced use of resources via new design concepts, workflows and use of digitalization. Bobst introduced two revolutionary innovations relating to flexo inking and color matching: Ink-on-Demand (IoD) and DigiColor. The IoD inking system replaces conventional inking reservoirs with a single rubber pipe that dispenses 30 grams of ink to the print unit. The system eliminates ink trays and chambered doctor blades. DigiColor, the solution for REVO Extended Color Gamut (ECG) printing takes the IoD concept one step forward: the hue of the ink dispensed to the print unit can be digitally adjusted by mixing a darker and a lighter shade of each color in the proportion required to match the target Delta E value during printing. The digitalization of the process gives converters and brand owners the certainty of matching Delta E at any speed, on any substrate, with any operator, anywhere in the world. The IoD and DigiColor technologies were demonstrated on a Bobst M5 DigiFlexo press. Closed loop and traceability on Bobst DigiFlexo technology was a world premiere. It combines Esko WebCenter platform managing production specification, approval and project life cycle, X-Rite ColorCertcolor communication system, AVT SpectraLab inline spectral measurement and monitoring, and PantoneLive digital brand color management assets. It is a fully digitized and connected workflow enabling the traceability of every item of packaging, from the original file, to the press, to job validation and storage of the digital data generated from the final printed job. This solution was presented live on an M6 DigiFlexo Press for flexible packaging. The Bobst DigiFlexo presses in demonstrations were equipped with all the latest technologies developed by the REVO partners: patented GTT 2.0 anilox rollers by Apex International delivered consistent ink laydown for uniform color consistency; workflow automation on color and register by AVT guaranteed digital control of color and print quality and on-the-fly adjustment capabilities; flexo plates by DuPont enabled 120L/cm print quality. A range of new technologies addressed the safety of food packaging. The new generation of low migration UV inks by Flint Group integrated into the REVO process, provides food-safe compatible printed samples. These are certified by the UV monitoring system by GEW, which allows the unique safety traceability of every meter of printed substrate. UPM Raflatac introduced new food label substrates that support product safety and legal compliance. “Our jobs set up very quickly, and the colors hit our customer signed-off Match prints most every time. For repeat work, our consistency is exceptional from run to run,” said Paul Polewko, production manager and technical director, Revere Group, USA. At the event, visitors discovered the recently opened REVO Academy, installed in Bobst Firenze’s new 1000 sqm Competence Center. The equipment encompasses the ESKO Crystal CDI 4835 XPS ECG separation and imaging and Kongsberg X20 cutting table, and X-Rite I1Io scanning table. The REVO Academy is open to converters worldwide to test and get trained on the turnkey ECG solutions. From the new file, in just one hour, it is possible to print the new job on press including plate making, plate mounting and press set up. Mouvent, the digital printing competence center of the Bobst Group, presented its LB702-UV high productivity digital label press in a 6-color set-up (CMYKOV) for the first time, showcasing digital ECG and spot color printing matching DigiFlexo ECG colors. As one brand owner put it seeing his jobs printed live in front of him, “You’re spot on!” Converters were very impressed with the uniquely high production speeds of 100 m/min reached during the live demonstrations, without compromising on the 1,200 x 1,200 Lpi print quality of Mouvent digital Inkjet heads. Instant job changes and especially real-time live customization left attendees amazed. “It was a great opportunity for us to present the unique features and simplicity of our digital solutions to such a high class audience, and the strong interest shown by visitors is the best sign that we’re on the right track with our offer,” summed up Reto Simmen, Mouvent’s chief business officer. 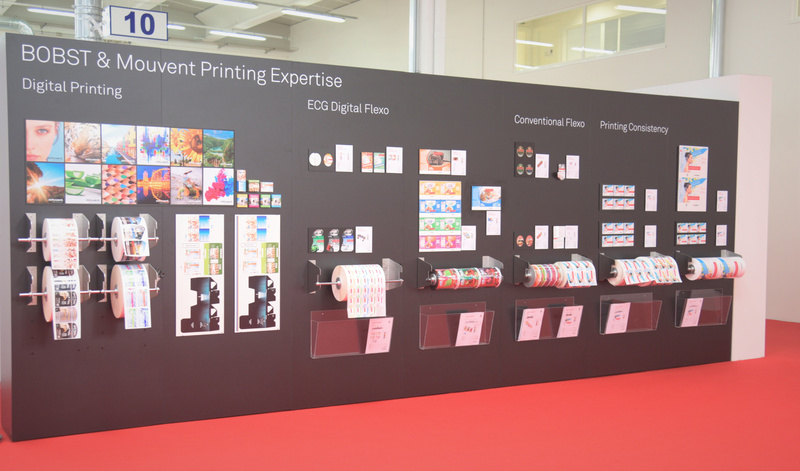 In a nutshell, the Label & Packaging Innovation event demonstrated how digitalization, automation and connectivity help converters to better serve their clients.